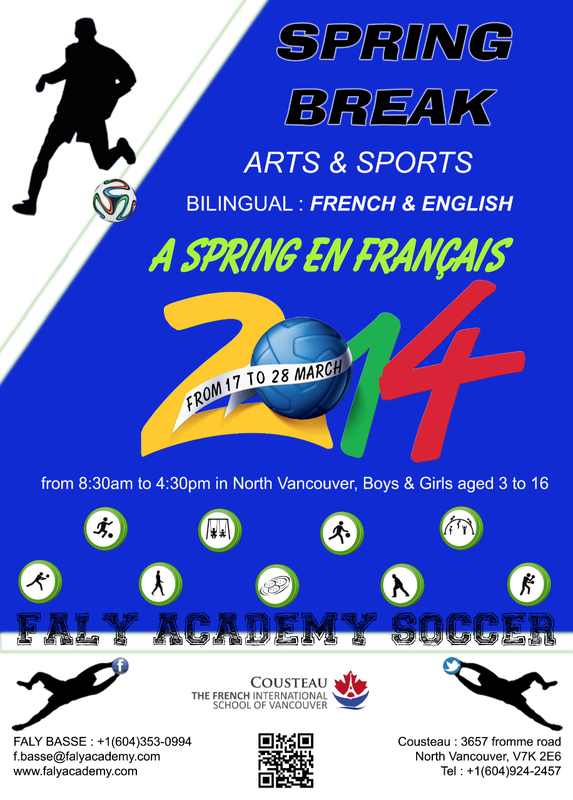 Here is an exciting Spring Break camp that combines arts, sports AND French at a convenient North Vancouver location! The day camp is run by Faly Academy, a high-performance soccer training organization led by Faly Basse, a former professional soccer player from France. Faly Academy is affiliated with several Francophone schools in the Lower Mainland, including the two Francophone schools in North Vancouver, École André-Piolat and The French International School Cousteau (ÉFIV). Many French Immersion students in North Van enjoy Faly’s popular after-school French-language soccer programs that take place at these two schools. Full-time camp with arts, sports and cultural outings camps (soccer, basketball, swimming pool (subject to pool closure/availability), Maplewood farm, Vancouver zoo, laser dome, bowling and various games…) in North Vancouver from 8:30 am to 4:30 pm. Soccer intensive in the morning from 9am to 12pm, (the soccer camp is led by head coach Faly Basse) and art and sports camps in the afternoon. Previous Previous post: Coming soon: CPF North Vancouver’s annual French Film Festival! Next Next post: Registration for BC Family French Camp 2014 – now open! Make sure your CPF membership is up-to-date!